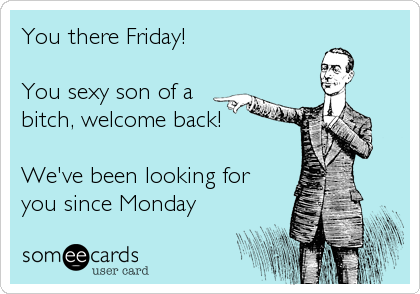 seriously y'all, thank the lord it's is Friday. I have not worked a full week in what seems like months. Nor have I been at my house for an entire weekend in forever. Since it is taking all that I have to get through this final day of the work week, I am keeping it short and to the point today. My house is a wreck, my closet/laundry is in shambles, I have not seen my niece and nephew in 3 weeks and my friends in even longer, I cannot remember the last time I saw the inside of a grocery store or even made a meal and if you came to my house you would not know it was fall. time to rectify all of the above travesties this weekend. Clean out closet aka take crap to JR league Clothes Rack. I feel like if I let you know my to do list, you will hold me accountable on Monday for checking every single thing off this weekend. Wish me luck and have yourself one heck of a grand weekend! Sounds kind of like our to-do list! Its great to travel but its always nice having that first weekend back home to catch up. Have a good one!